If your furniture has lost its charm and you’re thinking of spending a ton of cash bringing in all new furniture, you might want to consider a these paint applications to give it new life and a new look. 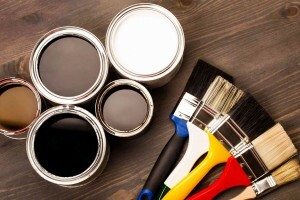 If your furniture has lost its charm and you’re thinking of spending a ton of cash bringing in all new furniture, you might want to consider a new fresh coat of paint first. These paint applications can liven up any piece of old furniture, giving it new life and new look. Create all new pieces to suit any room and give it a unique pop of color when you make use of clever of paint applications. Read on to get inspired! If you are looking for a bold modern twist to take a plain dresser or other piece of furniture to the next level, consider making use of geometric design. This can be done in bold colors for an eye catching look, or neutrals for an understated and elegant twist. First paint the entire piece a solid color, then add the design of your choice. Add pops to furniture with traditional cane detailing making use of metallic paint. Depending on the piece of furniture, you will have to first remove the existing finish with a fine grit sanding block.Next add a spray coat of primer and lastly your metallic finish. These are available in semigloss and gloss finishes. Certain paint applications will provide bold unnatural flair, but wax is ideal for those with more organic and minimal tastes. You can preserve the natural beauty of rustic and earth wood furniture and add extra durability by adding wax after staining. If you like understated elegance with a unique twist, this is one of the paint applications best suited for you. Using a combination of painted and stained finishes on wood furniture you will create a look that’s unique but not-obvious. People will know that something is different and worthy of note about your furniture, but may not be able to pinpoint what exactly is different at a glance.